If you frequent the Casa de Dom Inacio you might find some useful items here. The Casa de Dom Inacio is named after Inacio de Loyola (St. Ignatius). It was founded in 1979 by Medium Joao Teixeira de Farias as part of his healing mission. The casa is an ecumenical spiritual hospital where people from all over Brazil and the world come seeking healing for innumerable physical ailments. Everyone is welcome to the Casa de Dom Inacio regardless of creed, race, education, social background, nationality or financial position. All are welcome and invited. Millions of people have come to the casa seeking help. Many ofthem have been cured of ailments ranging from Cancer and AIDS to fractures and vision problems. Thanks to the work of the benevolent spirits of the casa many people now enjoy normal lives. Visitors continue to come from all corners of the world. In a typical day the casa will treat over one thousand people. The Medium, Joao Teixeira de Farias known around the world as John of God, is a full trance incorporation medium. He was born in the State of Goias, Brazil and for the last thirty years has made the city of Abadiania the place for his healing mission. Joao, receives incorporation from spiritually advanced beings such as St. Ignatius of Loyola, St. Francis Xavier, St. Francis of Assisi and many others. His mission has touched the lives of millions of people who continue to seek his help every week at the Casa de Dom Inacio. 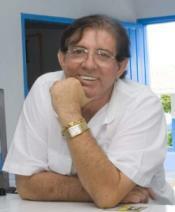 The Manager of the Casa de Dom Inacio is Hamilton Pereira. Long time resident and former Mayor of Abadiania. Hamilton has been a friend of Medium Joao's for decades and has taken on the adminstrative responsibilities of the Casa during the last 5 years. Hamilton's experience and level headedness has brought a lot of balance to the functioning of the casa. His office is in the back of the new bookstore. Stop by and say hello if you have a chance.